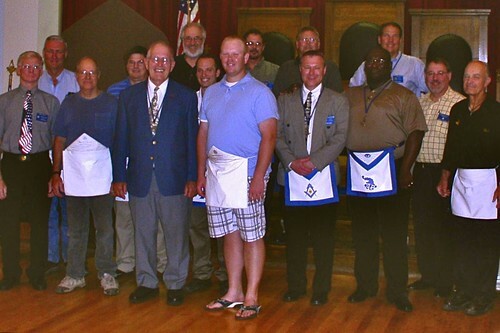 Brothers Trevor Johnson, Craig Pietsch, and Brian Hoyland were passed to the Degree of Fellowcraft on September 20, 2011. On a beautiful fall day, 19 Brothers gathered in Corinthian Lodge for a wonderful meal from the Stewards followed by very good ritual work. 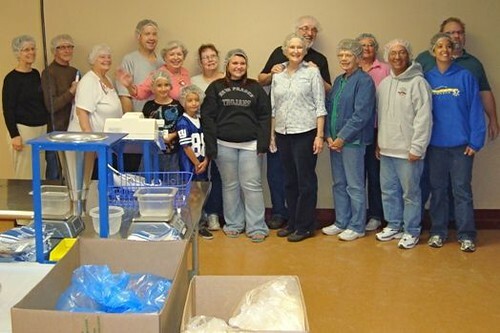 The new Fellowcraft did well on their proficiency exams, and are now anxiously awaiting the Third Degree on October 18, 2011, starting at 5 p.m.
On September 15th the Star went over to the Eagan location of 'Feed My Starving Children' with several Masons in tow. Many food packets were filled and sealed, and as always, it came as a surprise when they announced, "That's it! We are done!" The hour and a half goes by very fast, indeed. Watch the calendar for a chance to join with Star at this ongoing and very worth-while charity. You might get the chance to see several Past Masters and their spouses doing an impromptu 'chorus line' to a Michael Jackson song... ...plus you get to wear these nifty hairnets! Brother Chris Markum was passed to the Degree of Fellowcraft on Monday, September 12, 2011. Br. Chris soon leaves to rejoin the armed forces on the East Coast, but will return for a Third Degree whenever Uncle Sam decides it is a good time to do so. 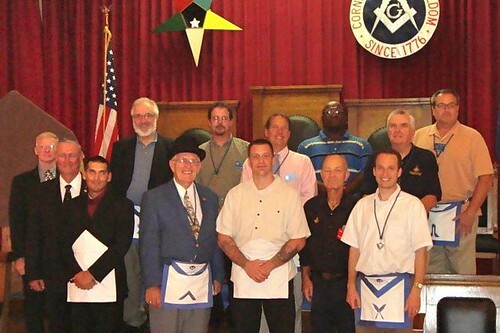 A thank you to the 12 Master Master Masons who assisted in his degree; an even bigger thank you to Br. Chris and his father, WB Jim Henderson, for giving us the honor of assisting. We look forward to seeing you soon, Chris. The headline above was excerpted from W.B. Paul Himmler's Grand Lodge Newsletter posting. Indeed, we have had the pleasure of hosting a 'set' of first degrees. And, on September 7, 2011, Chris Marcum and Brian Hoyland took their obligations as our newest Entered Apprentices. WB Jim Henderson stepped in as acting S.D., and did a splendid job of guiding two new Brothers. Brother Chris is home on a very short leave from military duty. He will be in Lodge next Monday, September 12, for the Second Degree program. Brother Brian will join the Entered Apprentices from the August 29th group when they will attend the Second Degree on our regular Stated Communication night, September 20, 2011. If you have not yet met either Brother, stop by say hello, and support them on their continuing journey. 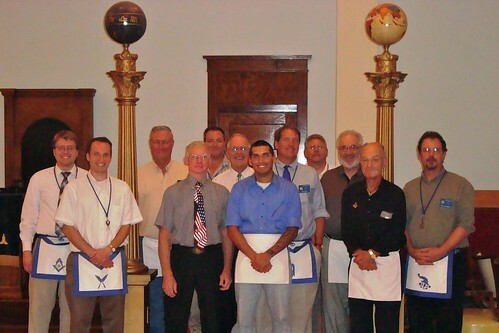 On August 29, 2011, Fourteen Brothers opened a Lodge of Entered Apprentices. By just after 9 o'clock, Sixteen Brothers left the lodge, two were new. Some were tired, most were quite warm, but all were in good spirits. It was a very good night, with lasting memories of W.B. Hugh Swift as acting Master from the East. 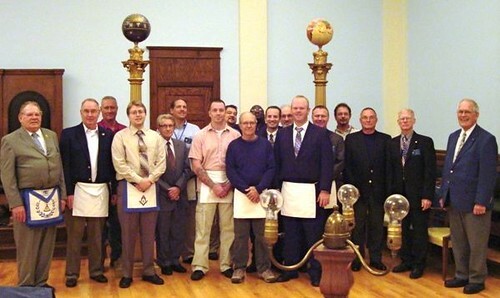 Trevor Johnson and Craig Pietsch were made Masons by their obligations in Corinthian Lodge. Both men look forward to their Second Degree on September 20th, and also to meeting more of the Brothers from Corinthian Lodge. September will be a busy month! If you have not yet met our new Brothers, please be sure to introduce yourself to Bros. Trevor and Craig.